Corn flour may be prepared from either white or yellow maize (corn) and should be milled after having undergone a de-germination process. (This equipment is also available from ABC Hansen.) 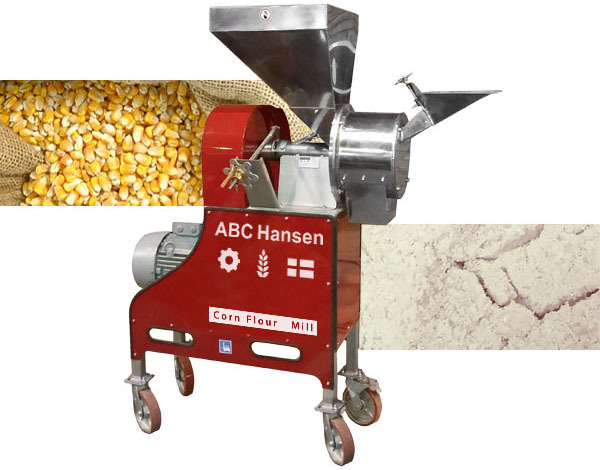 The Universal mill with stone application or a stone mill is a good choice to process corn flour. It is recommended to screen out all coarse particles prior to packing as corn flour should be fine and not gritty when rubbed between the fingers. Corn flour is may be used as a thickening agent (corn flour) in preparing soups, stews and other gourmet cooking. It is also used to stretch wheat flour when baking biscuits or other baked products and gives a peculiar texture to the product.